Posted on 7, September 2016 by EuropaWire PR Editors | This entry was posted in Banks, European Union, Government, Luxembourg, Management, Slovenia and tagged Alenka Smerkolj, EIB Governor, Republic of Slovenia. Bookmark the permalink. LUXEMBOURG, 07-Sep-2016 — /EuropaWire/ — On 14 July 2016, Ms Alenka SMERKOLJ, Minister without portfolio responsible for Development, Strategic Projects and Cohesion in the Slovenian Government since November 2014, was appointed Acting Minister of Finance following the resignation of Mr Dusan MRAMOR. 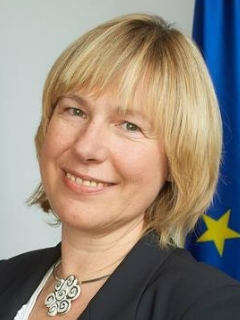 She also becomes EIB Governor for the Republic of Slovenia. From 1988 to 2014, Ms SMERKOLJ worked at Nova Ljubljanska Banka d.d. (NLB) where she held various positions including as Director responsible for financial markets. Over this period of more than 25 years, Ms SMERKOLJ was also in charge of relations with the Ministry of Finance concerning the NLB Group’s liquidity management. Ms SMERKOLJ was also responsible for NLB balance sheet management, trade in financial instruments, investment banking and securities custody. Ms SMERKOLJ served as a member of the Treasury Board at the Bank Association of Slovenia. Ms SMERKOLJ is Professor of French and Spanish at the Faculty of Arts, University of Ljubljana.